Ever wondered what it takes for your land to be eligible for agricultural valuation? Check out the guidelines by which the county’s agriculture intensity standards are created. You can figure out not just what we are looking for in order to qualify your land for agricultural use, but also how we make that determination. A Notice of Appraised Value is sent by April 1st or as soon as practical thereafter. 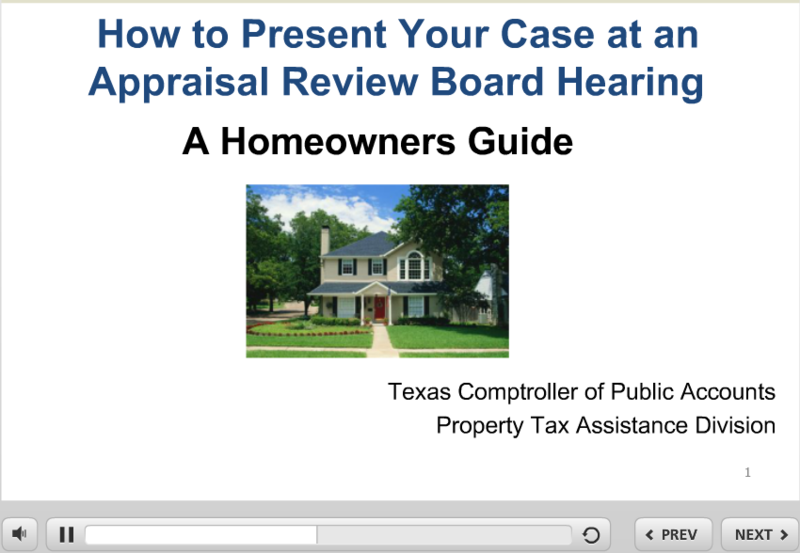 If you believe the appraised value of your home is incorrect, you may appeal the value before the Appraisal Review Board. The ARB is an impartial panel composed of your neighbors within the county. They will listen to you and the appraisal district’s representative and may adjust values based on the evidence presented at the hearing. Be aware of deadlines. File in a timely manner. Review any and all documents and forms sent to you thoroughly. Do not ignore mail from the appraisal district. Do feel free to ask us for our evidence and discuss your property valuation with an appraiser. Be on time for your hearing. Occasionally, the protest hearing of the owner scheduled before you may run longer than we anticipated. If that happens, please wait patiently in our lobby. You will be considered a no show if you are not present when the ARB is ready to hear your case, even if you were there earlier that day. You will be able to offer rebuttal evidence to anything presented by our appraiser. Make sure any changes to your property that you plan to introduce into evidence occurred before January 1st. It is your responsibility to prove our valuation was inaccurate. You can’t just say we’re wrong; you have to be able to say and show why. Keep in mind, we can only see so much of your home and may not be aware of other improvements or defects that are not immediately visible. We are also responsible to appraise thousands of homes in different neighborhoods, so please don’t get personal with our staff or the ARB. It’s important to present your case clearly and concisely. RCAD must establish the value of your property by a preponderance of evidence – meaning the more convincing evidence not the greater quantity. The ARB will tell you their opinion of your home’s value. You will be sent a written order by certified mail. What Are My Options If I Don’t Agree with the ARB? More information is available on the Comptroller’s website. A Notice of Appraised Value is sent by May 1st or as soon as practical thereafter. If you believe the appraised value of your business is incorrect, you may appeal the value before the Appraisal Review Board. Make sure any changes to your business that you plan to introduce into evidence occurred before January 1st. 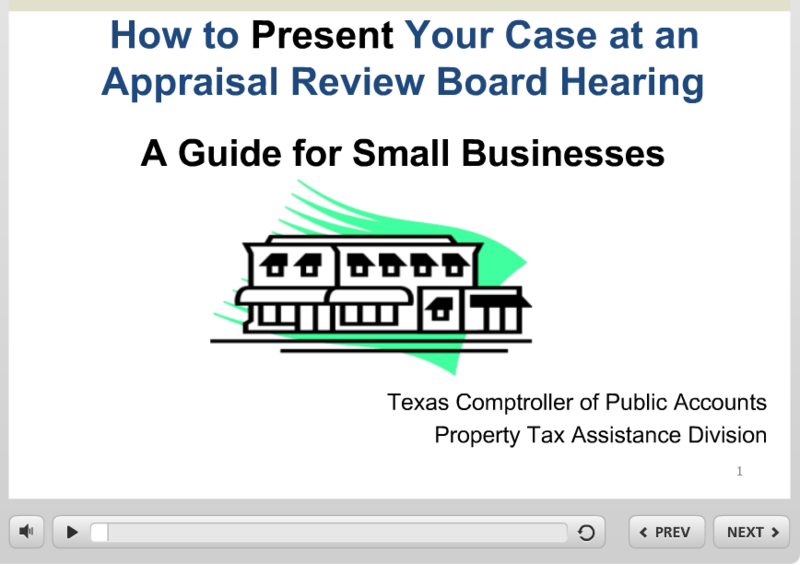 Neither our appraisers nor the ARB will visit your business. It’s your responsibility to bring your business to us. Bring documentation of anything that could affect the value of your business; i.e., fire reports, going out of business permits, blueprints, deed records, surveys, etc. Get a copy of our appraisal card and compare to make sure the square footage, inventory types, level of trade, etc. are correct. Keep in mind, we appraise hundreds of properties all over the county and few are alike, so it’s nearly impossible for us to know your business or industry as intimately as you do. Present facts and evidence, and do so clearly and concisely. It is perfectly acceptable to give the ARB a valuation amount you believe is fair and reasonable for your business. Looking for help to lessen your tax burden? Do you own or operate a business on property in Runnels County? Did you know you are required to file a Rendition Form with RCAD every year by April 15th? Even if you have filed in previous years and nothing has changed in your business. Click here to view additional information regarding your property taxes and you!